Reasonably entertaining action/adventure candy, deliberately corny yet mostly avoiding campiness. It’s a total homage to the classic old serials. In particular, a serial called King of the Rocket Men and several imitators thereof. (One imitator, which I sat through, featured a flying hero called The Copperhead.) Before we get too nostalgic, we should perhaps remind ourselves of how crappy and stupid most of those old serials really were. This version is mostly successful in managing to beat the serials at their own game (a job that, as other movies have shown, is not as easy as it sounds). The emotional tone of it sticks pretty close to that of the old days, though, because this is a Disney production. The graphic novel was reportedly a bit more grown up than the movie, which took out some naughtiness to make it all family-friendly. And in some ways that’s probably a good thing, because Dave Stevens, who wrote the Rocketeer graphic novel, has a reputation for drawing women as pinups, and drew the Rocketeer’s girlfriend as a straight clone of Bettie Page. Which explains why they cast a young Jennifer Connelly in the role. Connelly’s appearance here makes her, I think, the only actor to have major roles in three different movies, not related by common characters, among those reviewed here. My guess as to why she’s the one to have achieved this distinction is that she is probably, of all the faces in Hollywood, the one who best combines really solid acting chops with the kind of idealized appearance that you’d expect in a comic. Not that she shows any such acting chops at this early stage of her career — nor does a movie like this call for any. Nor does she yet have that idealized face, for that matter. I’ll forbear from speculating on how such facial evolution occurred... because I do admire her work and am nowadays forced to consider myself a fan. Anyway, she appears to have been cast here largely on the strengths of her impressive bosom, because that’s the aspect of her character that the movie most emphasizes. Disneyfication does hurt in some areas, such as the juvenility of the hero’s way of relating to his girlfriend. Like, he lies to her about wrecking a plane he was planning to race in, then he sneaks into her workplace and causes breakage and gets her fired (komedy! ), and then when she’s pissed at him, complains that he doesn’t understand women. I mean, sure, there are people this stupid in real life, but come on. This is supposed to be the good guy. But that used to be a traditional way to write adventure roles for a young audience, and at Disney, certain traditions sputter on. Disneyitis also hurts some in the action scenes, which kind of vacillate back and forth between being exciting, and being dumb enough to make you shake your head while watching. Sometimes the movie can switch between these two states three times in one minute. 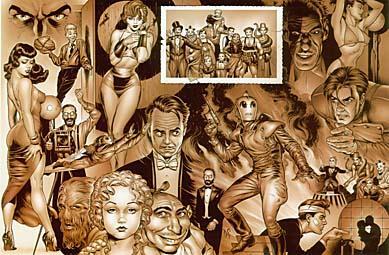 Bill Campbell fits perfectly into the heroic Rocketeer role, in a generic and forgettable sort of way. Timothy Dalton as the bad guy (a Nazi Errol Flynn!) looks like he’s finally learned not to take fluff roles overly seriously... and perhaps learned that lesson too well. Alan Arkin shows that he can act as well while sound asleep as the others do awake. The modern film that this can best be compared to is, I suppose, Sky Captain and the World of Tomorrow. Which is superficially not as juvenile as this, but on some level is even more determinedly anti-adult. (Or maybe one should just view it as a big gay camp-fest, I don’t know. Because it’s, like, self-consciously-ironically juvenile. Or something.) Anyway, it’s pretty hard to choose between that movie and this one on any critical basis; they’re about equal on the stupid-meter, and either one makes any Star Wars movie seem Ingmar Bergman-like on the adult seriousness scale. a gem of a Disney adventure movie... superexciting... and the script always maintains a clear-cut distinction between good and evil.